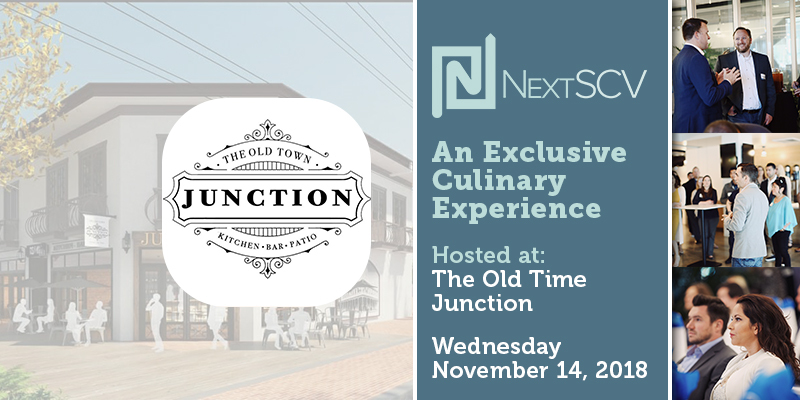 Be one of the first to experience Newhall’s hottest new restaurant by joining us for an exclusive culinary experience at the Old Town Junction! Meet Santa Clarita’s beloved gourmet chef, Daniel Otto, and hear from two local entrepreneurs who started two of the most forward-thinking and technologically advanced companies based here in Santa Clarita. Ajay Kapur, Cofounder of Kadenze and a professor at California Institute for the Arts, and Robert Bruza, CEO of Outlyer Technologies will share how they saw an opportunity and a need in their respective industries and turned a creative idea into a lucrative and impactful business. If you’re hungry for something different, we’re cooking up a memorable evening that you won’t want to miss—this is truly a NextSCV event like never before. Open to Santa Clarita young professionals ages 21-40, this special event is part of Innovate Santa Clarita, a campaign and series of events focused on inspiring entrepreneurial doers and self-starters from all backgrounds. Follow along at #InnovateSCV or visit InnovateSantaClarita.com for more information of entrepreneurship and innovation in Santa Clarita. This event is by invitation only. If you would like an invite, please email Hello@NextSCV.com.